Many of the most successful speakers started out with fear of public speaking. They are a success today because they faced their fear and went on the stage to speak. They discovered that the more they spoke in front of audiences, the more comfortable they became, the more they developed their confidence and the more the fear went away. I understand though that sometimes our nerves do get the best of us; it can happen to the most seasoned professional. 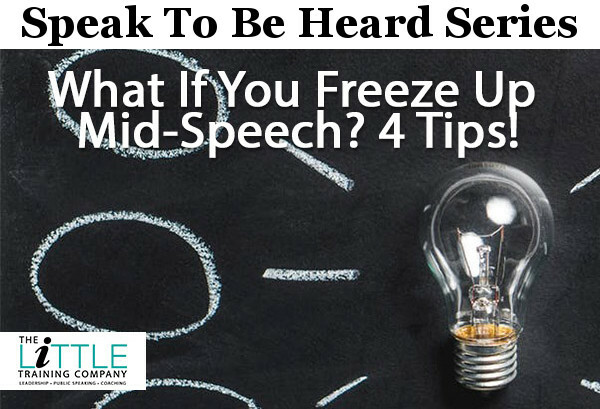 So I put together 4 tips that you could use in case you freeze up mid-speech. While we all want to imagine people hanging on our every word, the reality is, people are a varied bunch who are going through as many internal and physical shifts as we do, so don’t let audience reactions trigger more fears. Just remember, these people came out to hear you speak so they want you to be good. They’re actually rooting for you! If you can remember they’re on your side it’ll be easier to shrug off anything that “appears” to the contrary. 2. Using “What Happens Next”? If you do freeze up mid-story or speech, take a second to calm your breathing and ask yourself, “What Happens Next”? 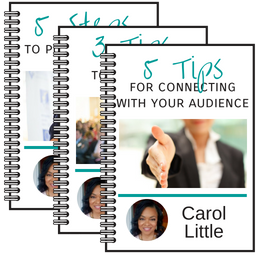 (Hint: The ‘what happens next’ approach works especially well for people who prefer memorizing their entire presentation.) If you really get lost, stop and ask if anyone has any questions before you move on. It’s a great way to stall for time and the questions may actually jog your memory. Thankfully hecklers are few and far between in the average coaching presentation, but if you get one, it is not the end of the world. In fact, if you handle it the right way, it can actually bolster your authority and reputation. A heckler can range anywhere from someone yelling outright insults to someone who just rolls their eyes at you and pulls skeptical faces. Unless they’re so out of control that you need to call security for everyone else’s sake, it’s usually better to call hecklers on their attitude—not in a combative way, but acknowledging their possible objection—and dealing with that objection proactively, on the spot—just as you do in sales letters. Acknowledgement disarms people, creates transparency and helps release any tension from the room. So you say a wrong word, or pause too long. Maybe your mind goes blank in the middle of the presentation, don’t panic: It’s not the end of the world. People are usually sympathetic rather than judgmental, and if you cheerfully acknowledge obvious mistakes—even pass it off with a smidgen of humor—you can quickly get yourself back on track, with no harm done. Making the decision to overcome a very natural fear of public speaking can feel like one of the biggest leaps you can take. But approach it like a true professional, do your best to deliver value and help your audience, and you will also find that, emotionally and financially, it can bring the greatest rewards too.